Today the Sydney Opera House unveiled its 2019 Children, Families and Creative Learning program with a compelling suite of works for all ages encouraging creativity for life. In 2016, the World Economic Forum predicted that 65% of children entering primary school today will end up working in jobs that do not currently exist. This new program aims to inspire children through theatre, music and play to face these unforeseeable challenges creatively, as well fostering a life-long relationship with the arts. 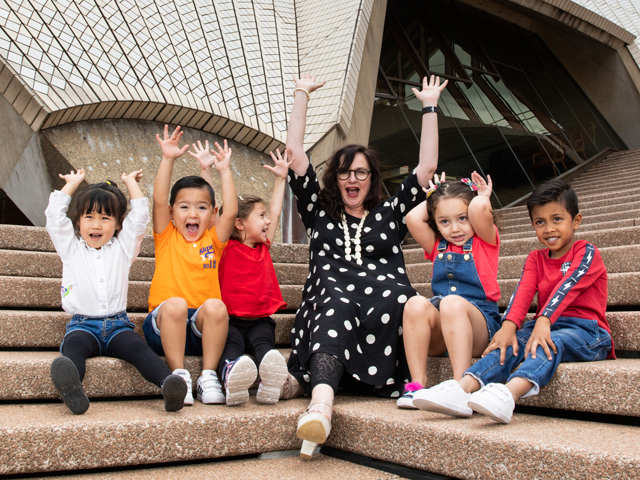 Sydney Opera House Head of Children, Families and Creative Learning, Bridgette Van Leuven says: "We place children at the centre of every part of our program. By introducing them to the possibilities of a life creatively lived - both at school and at home - we are setting them on an irresistible path of stories, music, dance and magic as well as providing them with the tools they'll need to think on their feet, empathise with others and adapt to new situations in the future." The program takes a multi-channel approach to connect with children at a range of ages and stages of education. By offering various ways to experience the Opera House - whether at one of the many year-round theatrical experiences with their loved ones, or excursions and digital streaming with their schools - this interconnected program helps guide children on their creative journey. Learning doesn't just happen in the classroom but is continued at home through the school holidays. Families can continue their creative journey in 2019 with a diverse array of 15 different shows for all ages, genres and interests across comedy, music, circus, animals and page-to-stage adaptations, touching on gender diversity and differing cultural perspectives. Little ones can look forward to a delightful adaptation of beloved Australian author Mem Fox's Possum Magic, a daring display of break-dancing's raw energy with Between Tiny Cities and Meeting Mozart, an early introduction to classical music with a healthy dose of silliness. Eight productions will be available for school excursions where teachers can walk their students beneath the iconic Sails and be inspired by the thought-provoking works inside. These include: Playlist, which examines music and culture through an adolescent female lens; The Red Tree, inspired by Shaun Tan's world-renowned melancholic yet charming book by the same name; and Dinosaur Zoo, a spectacular puppetry piece with fossils and frighteningly fun facts. For regional and remote schools unable to physically join the audience, the Digital Creative Learning Program's free live-stream technology welcomes pupils to Bennelong Point without having to leave their classroom. In 2019 the Opera House's pioneering digital program features two digital author talks (with Shaun Tan, The Red Tree and Tim and Judy Sharp, Laser Beak Man) where students can submit questions ahead of time, plus 20 interactive workshops lead by professional artists, 15 virtual tours of Bennelong Point and the Sydney Opera House, and three live-streamed shows, direct from the stages. To view the complete 2019 Children, Families and Creative Learning program, click here.